Located on the Sydney side of Bathurst. A 3 bedroom stand-alone cottage on 100 acres. In-ground pool and enclosed backyard. Fully furnished including your linen. Fully equipped kitchen including a dishwasher and microwave. Very spacious inside but simply furnished without clutter. Two bedrooms have queen beds (one with an ensuite). The third bedroom has a single bed. There is also a double sofa bed in the lounge room if needed. A slow combustion fire will pump the heat out in the cooler months and a pool for the summer! Lovely, uninterrupted rural outlook for a relaxing getaway. 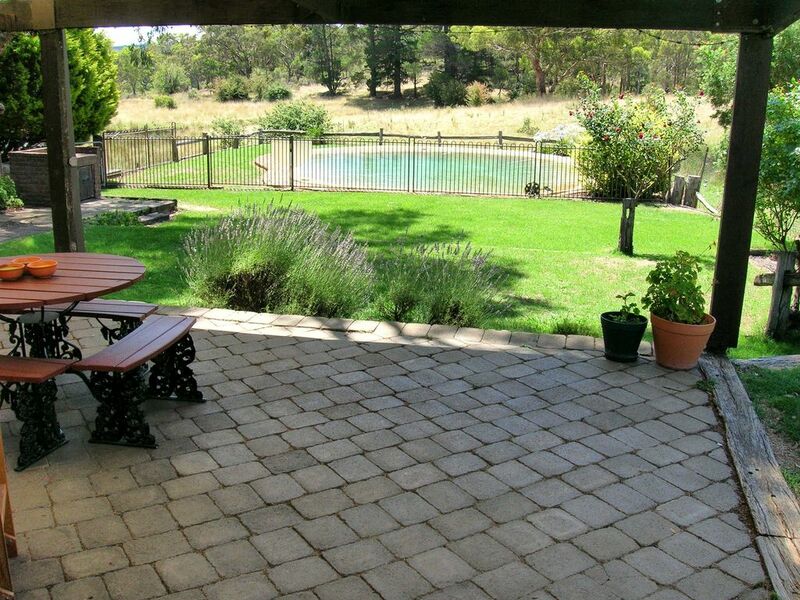 Great bushwalks available and you can watch the kangaroos while you have your coffee on the north facing verandah. There's lots to see in the area including Mt Panorama, Jenolan Caves and the historic villages of Sofala, Hill End, Millthorpe and Carcoar. There are also some fantastic restaurants, pubs and wineries in our lovely area. We supply some farm fresh eggs and there's also an Aldi coffee machine with a small supply of pods. If you are coffee lovers, you might like to bring some more with you. The owner's house is approximately 50m away, should you need anything during your stay. toilet, combination tub/shower, Main Bathroom: Shower over square bath, toilet, vanity. toilet, shower, Ensuite: Shower, vanity, toilet. Located on 100 acres. Lovely bushwalks, creek. Tranquil setting for a relaxing break away. Oil, S&P, tea & coffee, sugar, farm fresh eggs. Great country retreat, and very nice hosts with lots of little extras provided. Thanks Craig. Glad you enjoyed our 'magic spot'. A nice quiet break away from the race track for sure! Hope to you see all again. What a beautiful place to stay with very friendly hosts. The house was very spacious and had everything we needed. The highlight for us was definitely the fantastic pool and well maintained beautiful gardens. So glad that you enjoyed your stay and especially the pool which is such a bonus, especially in this hot weather! Hope to see you again. Me, hubby and the kids stayed here over the weekend, and I must say one of the best getaways ever! Beautiful clean home, so peaceful, amazing owners. Definitely will go back soon. Dear Maysa. It was an absolute pleasure to have your beautiful family stay in our cottage and so glad that you had a lovely time. We are truly looking forward to welcoming you back again. You were fantastic guests in so many ways and so happy to have meet you all. We are a small race team that stayed at Bimbenang got the Bathurst race weekend. It was so nice after a busy day at the track to go back to the house and be able relax, the house is beautiful and clean and cozy, thank you so much Jane we had a great time at your house.